This fun skill game will definitely become one of your favorites as soon as you play it a few times because it has a really cute squirrel that likes to fly around and hopefully collect lots and lots of nuts. You will need to try your best to make her gravitate around the blue objects in order to collect the nuts. Make sure you will toggle the gravitational system of the spaceship and hopefully you will do this well enough that after you have collected all those nuts you will be able to collect the stars as well because that is the dream of this squirrel. Use the mouse and Space to play. 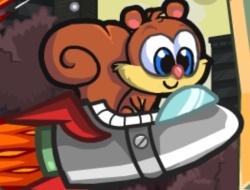 Rocket Squirrel 0.00 between 0 and 10 based on 0 votes.